It was top against bottom in the First Division on Tuesday night as champions Limerick welcomed basement boys Athlone Town to the Markets Field. The home side were still smarting from their first league defeat of the season to Cobh Ramblers three days earlier and were heavily fancied to beat a struggling Town outfit still without a victory on the road. The form suggested another comfortable win for the Blues who had already beaten Athlone three times in 2016, scoring 10 goals in the process and without conceding any. 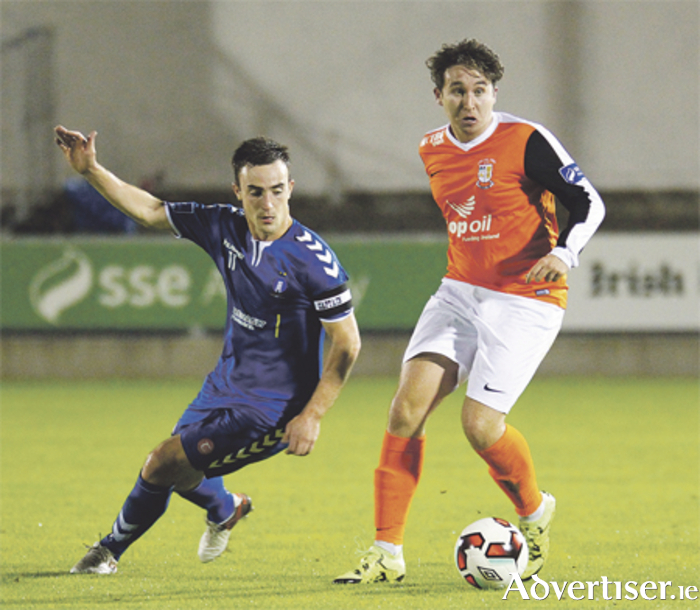 It had been nearly a year since Athlone last won away in the league and with only pride to play for, Colin Fortune’s men were anxious to avoid a heavy defeat against the free-scoring table-toppers. Athlone showed two changes to the team that had drawn with UCD, as Jack Quinn and Aidan Byrne were unavailable, Cormac Raftery returning from suspension and Roy King stepping up from the substitute’s bench. The home side included Garbhan Coughlan, who won a league medal with Athlone, and also had Val Feeney, who was on loan to the Town earlier this season, on the bench. As expected, Limerick were on the attack from the start and it was former Athlone player Coughlan who should have opened the scoring after 13 minutes, but he fired wide with the goal at his mercy following Aaron Greene’s left-wing cross. Coughlan had a further chance on 28 minutes when his shot was cleared behind by Cormac Raftery for the second corner kick of the game. Sean McSweeney also came close soon after but Athlone were still surviving as half time approached. Intent on keeping the hosts at bay, Athlone were seldom seen as an attacking force. Claudio Silva had a rare chance in the opening half, but he fired over after nine minutes of play. A better chance was created just before the break when Chris Reid was inches away from connecting with Ryan Gaffey’s free kick from the right as Athlone looked to take a shock lead. It was still a surprise though that the half ended scoreless as the Town replicated their last visit to the Markets Field with a solid first 45-minute performance. The good opening continued on the resumption of play for Athlone as a first corner kick was earned inside five minutes; Ian Fletcher heading over from Gaffey’s delivery. It proved to be a temporary respite though as Limerick continued thereafter on the offensive, but as frustration grew a double substitution was made, John O’Flynn and Chris Mulhall joining the action just after the hour mark. The former almost created an instant impression but was denied a goal with his first touch by Dylan Owens who got down low to push the ball behind. First Town sub, Ioris Oyeniyi also made an early impact following his introduction after 65 minutes and created the opening for the visitors’ best chance of scoring to date. The speedy winger pulled the ball back for David Brookes who had initially carried the ball forward on a good run but goalkeeper Tommy Holland stood firm to push the strike over the bar. The longer the game went on the more belief Athlone had that they could somehow hold the league leaders and two further corners in as many minutes reinforced that idea. The dream was shattered, however, with 14 minutes remaining and it proved to be a personal disaster for Owens who had previously looked solid between the posts for the Town. Full back Shaun Kelly overlapped down the right flank and although his cross picked out third home substitute Paul O’Conor on the penalty spot, Owens looked to have the resulting header covered, but somehow the keeper fumbled the ball to the net at the post. Athlone never fully recovered from this setback. Gaffey might have rescued a point late on with a free kick from the edge of the penalty area, but Holland got down well to parry the effort as Limerick held on and secured full points thanks to an unfortunate error. Athlone wrap up their away campaign with a visit to managerless Waterford United on Sunday afternoon.